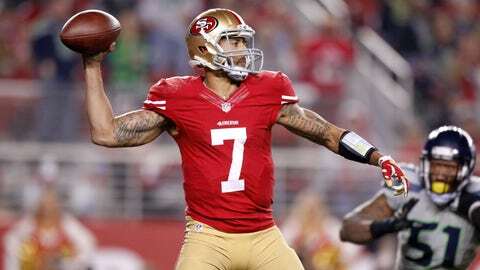 Colin Kaepernick threw for just 124 yards and was sacked six times Thursday night. After the 49ers’ 20-3 loss Thursday night to the Seattle Seahawks, there was talk around San Francisco on Friday of "big" moves — perhaps including a change at quarterback, where Colin Kaepernick has struggled greatly in his first season outside the purview of former coach and mentor Jim Harbaugh. But first-year coach Jim Tomsula nipped that in the bud at his Friday availability, telling the media, "Yes, Colin’s our quarterback. No controversies." It was a statement that left little room for interpretation. Kaepernick went 13 of 24 for 124 yards and was sacked six times in a dismal performance against the Seahawks, one that renewed questions about his status as the starter. Overall this year, Kaepernick is completing 61 percent of his passes for just 185 yards a game with six touchdowns and five interceptions, and the Niners are 2-5 and in last place in the NFC West. After Thursday night’s loss, Kaepernick had a bandage on his right thumb, but Tomsula said Friday that there was nothing that "shows me concern," apparently referring to the injury.